How to sprout seeds and how to grow sprouts are the same thing, and once you learn how you will be amazed how easy it is to grow these little nuggets of nutrition. They are a great compliment to your raw diet. Want fresh raw vegetables cheaply all year round? Just sprout seeds! Homegrown sprouts are the perfect compliment to your raw vegetable diet. Sprouting seeds and knowing how to grow sprouts is not hard and you will be rewarded with lots of tiny vegetables all year round! Sprouts are crunchy, flavorful, raw and packed with many nutrients. A tiny seed contains all of the nutrients and plant machinery to produce a whole new plant. When you sprout a seed, you are unleashing this energy and starting the growing process. Each tiny sprout is a small version of an entire and mature plant. You can learn to sprout just about any type of seed, so once you learn how to grow sprouts then you can experiment to find your favorite types and kinds of sprouts. One of the major benefits of knowing how to sprout seeds is that you will be able to know how to grow just the right amount of sprouts that are just enough for your immediate needs. Once you have the seeds you want to sprout, all you need to have is water, a bit of natural sunlight, and a container to grow the sprouts. Although you can actually sprout any type of seed, never sprout seeds that yield a poisonous plant. Some of these are tomato, eggplant and potato seeds. Sprout these poisonous seeds only if you want to plant them in your garden and harvest the vegetables. Among the most popular seeds to turn into sprouts are alfalfa, buckwheat, pea, broccoli, clover, fennel, lentils, mustard and sunflower seeds. When you choose your seeds to sprout, the best choice are organic seeds. You can purchase sprouting seeds at your local health food store or online. There are several ways to learn how to sprout seeds. You can buy sprouting kits with all of the necessary (and and sometimes unnecessary) equipment. Each of these methods has their advantages and disadvantages. Here are three of the most common ways for sprouting seeds. Sprouting Jars – Using sprouting jars is the easiest and cheapest method of sprouting seeds. Using a sprouting jar is a great way to learn how to sprout seeds. 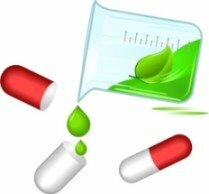 Since this is the most easiest and inexpensive way to learn how to sprout seeds, this method is explained in more detail below. An inexpensive option to a sprouting jar is a quart or half gallon canning jar (depending on how much sprouts you can eat) with a lid and mesh screen. Sprout Bags – Sprout bags are great for grains and beans that don't require light. Sprouting bags are easy to make and easy to use. The downside of bags is that they can be messy. They are easy because all you have to do it dip them in water and hang them up to dry. You can make your own sprout bags. The best materials are hemp, cheesecloth, or linen since these materials retain moisture better. Or, if you prefer, you can buy sprouting bags. A sprouting bag is a versatile piece of equipment in the raw food kitchen because in addition to using it to sprout seeds or beans, you can also use it to make seed and nut cheeses. Trays – Sprouting trays are perfect for growing grasses and sprouting seeds that require a lot of sunlight. Sunflower seeds and peas grow better in trays. Sprouting trays are usually made of plastic mesh and provide a large surface area to soak up sunlight. One of the benefits of investing in sprouting trays is that you can easily sprout several different types of seeds in these stackable trays. Sprouting trays are good to grow lots of sprouts or several different kinds of grasses, seeds and sprouts at one time and without soil, using only water. Sprouts grow best in sprouting trays since they grow naturally upward and do not have to be disturbed unlike being clumped together or jostled when using a sprouting bag or jar method. A two-quart canning jar is perfect. Many times, craft store sell these larger 2 quart jars. However, just about any large glass jar can be successfully used for learning how to sprout seeds. Cover the mouth of the jar with a mesh lid made for spouting purposes. You can purchase a plastic mesh lid for sprouting jars at a health food store that sells sprouting supplies. If you don't have a mesh lid, cover the mouth of the jar with a porous material such as cheese cloth or linen and secure with a thick rubber band. Your sprouting jar is ready for use. Rinse and Clean Your Seeds. Place the seeds in a bowl of water and rinse them to remove any dust and pesticides if the seeds are not organic. Also, remove any foreign particles, hulls, misshapen seeds, etc. Seeds are dormant so the soaking process “wakes them up.” It is very important to use pure water in the soaking process since the seeds will absorb the water and ultimately, you will eat the seeds that have absorbed the type of water they've soaked in. Soaking seeds and nuts also removes stored fats making them easier for humans to digest. 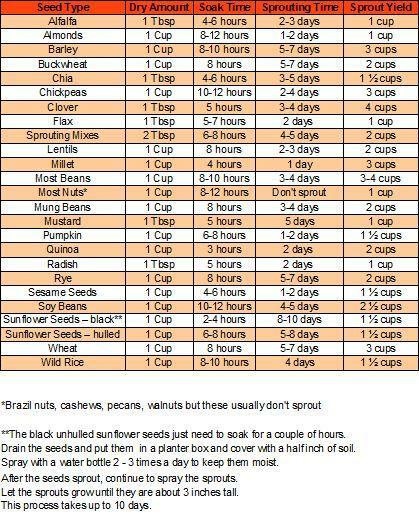 This is why you should soak seeds and nuts for at least a few hours, even those that you do not use for sprouting. Use a ratio of about 1 part seeds to 3 (or more) parts water and soak for about 8 to 12 hours, or follow the seed supplier's instructions. Different seeds require different soaking times as some seeds absorb more water than others. If you soak the seeds for too long, you risk drowning them. Remove any seeds that float on the surface of the water and do not sink. When the seeds are finished soaking, drain off the soak water and use fresh water for sprouting. Place your cleaned and soaked seeds into the sprouting jar. Add just enough water to cover the seeds, then invert the jar to drain thoroughly. Sprouts are tiny plants and as such, they need to be watered. Since there is no soil to hold the water, they need to be watered or in sprouting terms “rinsed” at least twice a day, usually three times a day. Tap water is okay to use for rinsing the sprouts. Use your hands or swirl the jar to make sure that there are no clumps of sprouts, but all get watered equally. Then invert the jar to drain. Failure to drain properly can cause mold growth. Repeat the rinsing and draining process until sprouts form, usually in a few days. A good place to keep your sprouting jar is at the sink, with the jar tilted at a 45 degree angle so all of the excess water can drain out. Depending on what type of seeds you are trying to sprout, the sprout “tails” will appear in a few days. Repeat this watering process at least twice a day, three time is better until the seed “tails” appear. Follow the instructions from the seed's supplier about the right time to harvest your sprouts. Different sprouts grow at differing times. When you are ready to harvest your sprouts, you may want to de-hull them. Hulls are an edible source of fiber and can be left on. If you decide to de-hull your sprouts, place them in a bowl of water and swirl them around with your fingers. The hulls will float to the top where you can remove them. Let the sprouts dry on absorbent toweling or run them through a salad spinner to dry before placing them in your refrigerator. Sprouts stored wet will spoil more quickly then dry ones. Sprouts stored in air-tight containers may keep for over a week for your enjoyment and enhancement of your raw vegetable diet. When you need more sprouts, just get more seeds. Now you know how to sprout seeds, and at a fraction of the cost of purchasing sprouts!